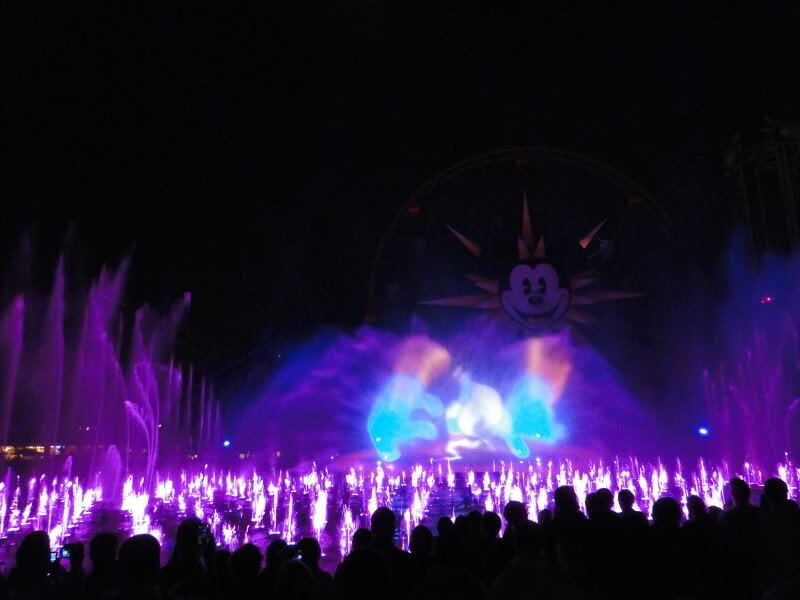 We’ve had a chance to see World of Color at Disney California Adventure twice using Disney’s World of Color Dinner Packages with Preferred Viewing. 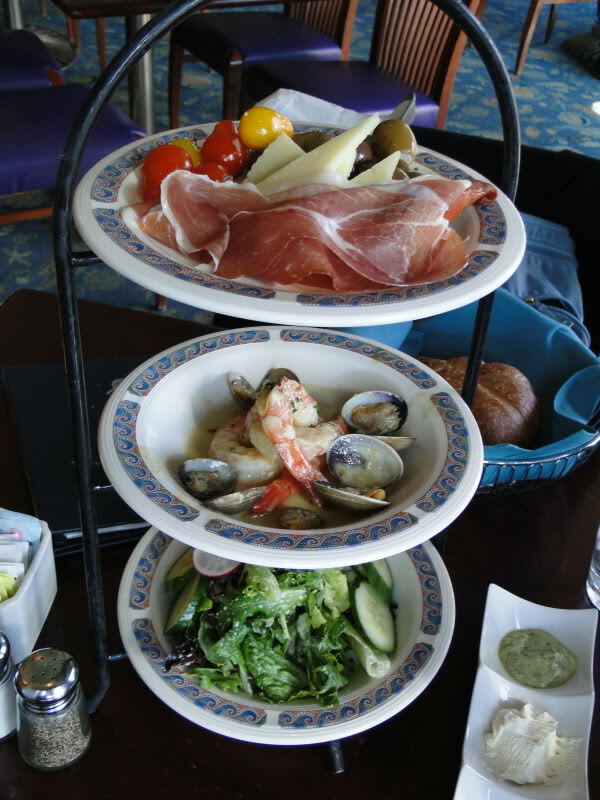 The following are mini trip reports comparing the two restaurants that offer these packages: Ariel’s Grotto and Wine Country Trattoria. 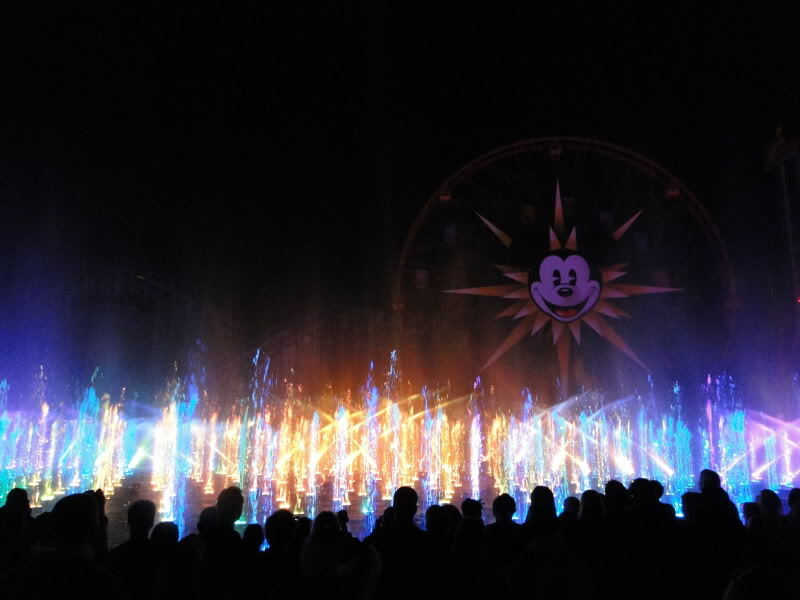 Note that reserved viewing for World of Color is also offered by Carthay Circle, but there is not set menu; you must order one entree and either a dessert or an appetizer per person. 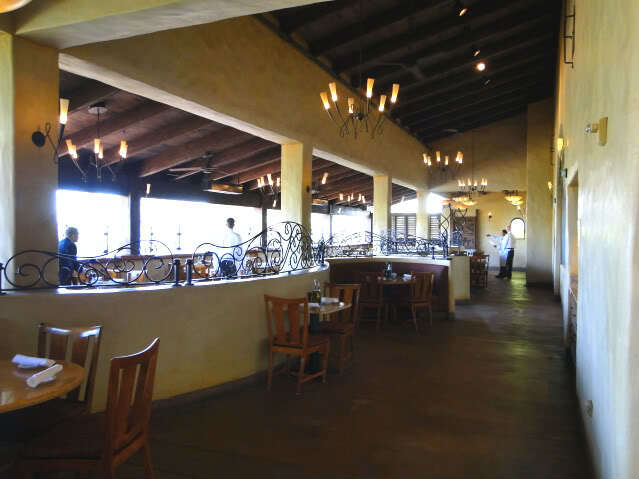 We picked Wine Country Trattoria even though it was more expensive than Ariels’ Grotto because, back in the day, the upstairs restaurant was the park’s one fine dining location and quite good. However, we found last night that now both upstairs and downstairs are devoted to the same aggressively mediocre fare. A few days after we made our reservation, we got a call from Disney Dining saying they’d overbooked and were moving us to 4:10pm. Not sure how that worked out for them, since we showed up at 3:55pm, checked in and were seated right away (although the kitchen resets between 3:30 and 4:00, so if you try to check in earlier, they smirk at you and tell you to come back closer to 4:00). The menu had already changed from what we were told we’d be getting when we made our reservation. 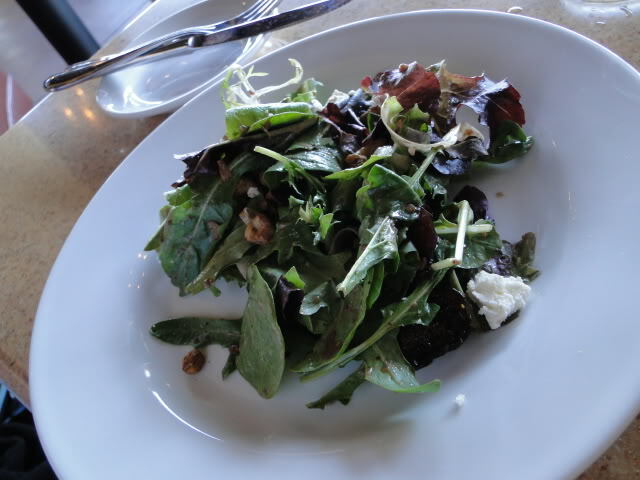 They dropped the mixed appetizer plate in favor of a pile of greens with a few crumbs of gorgonzola on it. What they didn’t drop was the price of the meal, and when you consider that Ariel’s still offers a full appetizer platter and is cheaper, it kinda stinks. The other thing they did which just makes me laugh is change “New York Steak” on the menu to simply “New York” to cover their patooties so they can change the cut of meat as needed. What I got resembled cheap Las Vegas buffet prime rib. 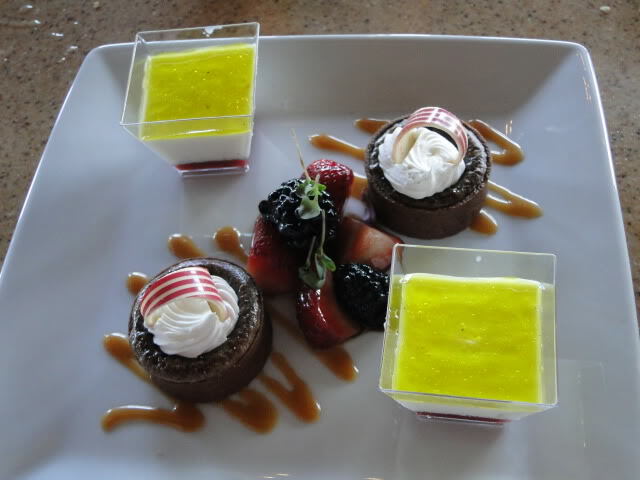 The worst part was dessert, which consisted of two tiny coffee-flavored chocolate cakes, some fruit doused in balsamic vinegar, and two nasty panna cotta “shots” covered in a layer of bitter limoncello liqueur. Well, at least it didn’t have chimichurri sauce on it! At the end of dinner they brought us our tickets with the bill. When I called the dining line to make another dining reservation (this time for Ariel’s) I was told that a 15% gratuity would automatically be added to our bill—but it wasn’t last night. 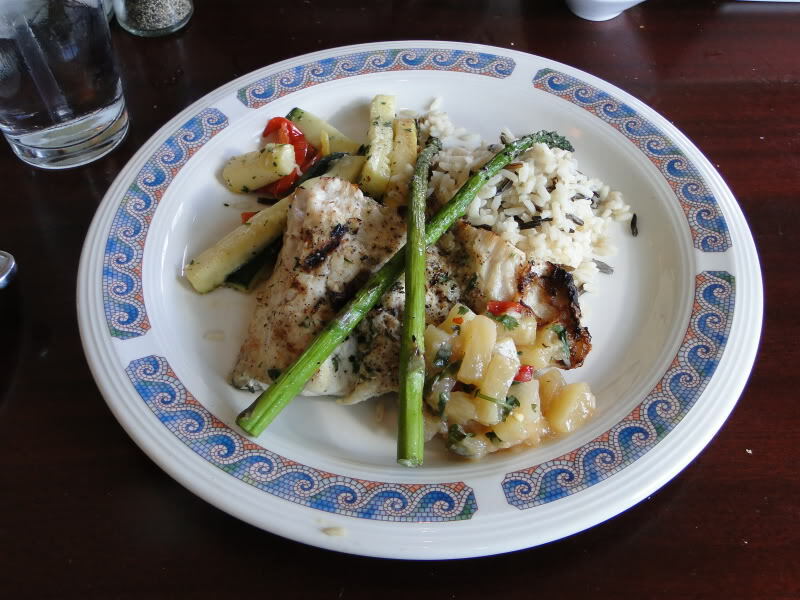 We used our Premium APs to get 15% off, but with the tip we still spent more than $80 on a meal that tasted no better than what you’d get at the French Market counter-service restaurant in Disneyland. A little before 7pm they put up barricades across the walkway, from the bridge to the future home of Ariel’s Undersea Adventure, with two breaks in them. 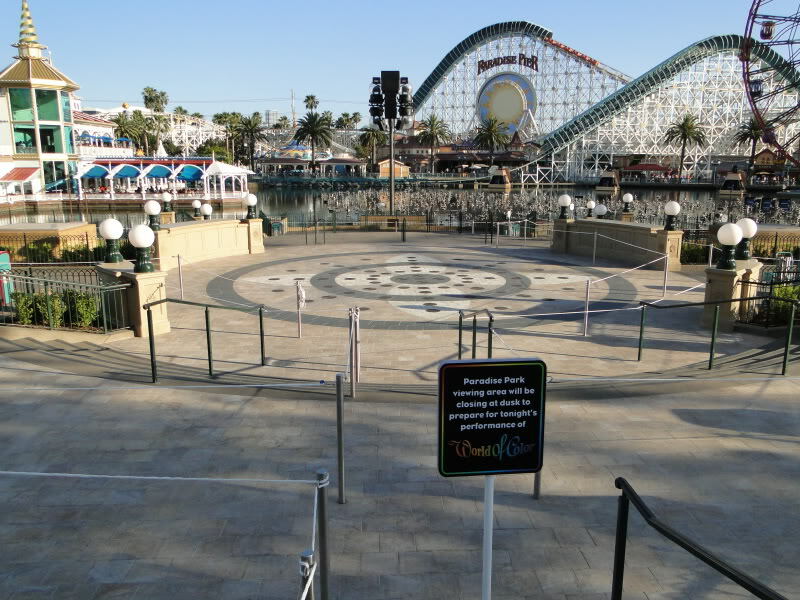 They said they were going to let us line up at the entrances to each colored area and we’d be there another 15 or 20 minutes before they let us into the park. Two problems: 1) The Preferred Viewing dining tickets do not have a color on them! 2) The colored lights people have been reporting were not turned on (or simply not visible) so you had no idea where to go even if you did know your color. I had heard from the message boards that Preferred Viewing put us in the blue area, but nobody told us this. And do NOT ask where “dining” is without using the term “preferred” because they will send you to line up for the bridge viewing area! I had been at the front of the barricades, but by the time I had asked 5 different CMs where the preferred viewing area was and decided 3 out of 5 must mean “blue” was the right answer, I was at the back of a big crowd lined up for the blue section. Hope that helps… The entrance to this section is halfway between the bridge and the Golden Zephyr. 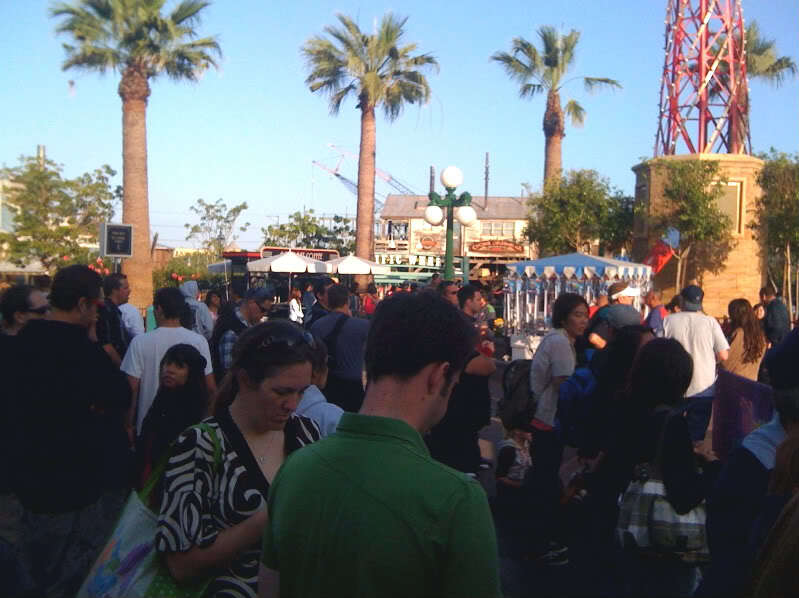 We all crammed in there for another 20 minutes until they began to let us into the park. So basically, don’t wait til 7:30pm to show up if you want your pick of spots. I’d say get there by 7:15pm at the latest. If you don’t care where you are within the viewing area, then 7:30pm is OK. The first CM we came to took our tickets, so when we got to the CM directing people toward the Preferred Viewing area, we had no way to prove we were supposed to be there. Fortunately, he took our word for it. Don’t give up your tickets to the first CM you see! We chose to stand at the top of the stairs in the “dry” section so that no one standing in front of us could block our view. It is pretty much dead center and a good spot if you want to see the full scope of the show, but I think next time we’ll just wear ponchos and get as close as we can so we can be figuratively AND literally immersed in the show. 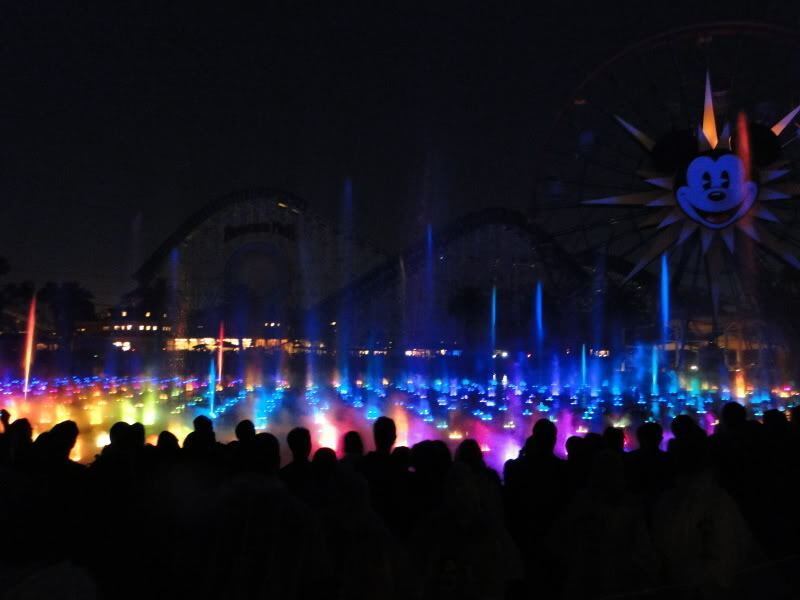 OK, I didn’t want to put in any spoilers, but here’s one shot to show you how centered World of Color is when you’re in the Preferred Viewing Section. 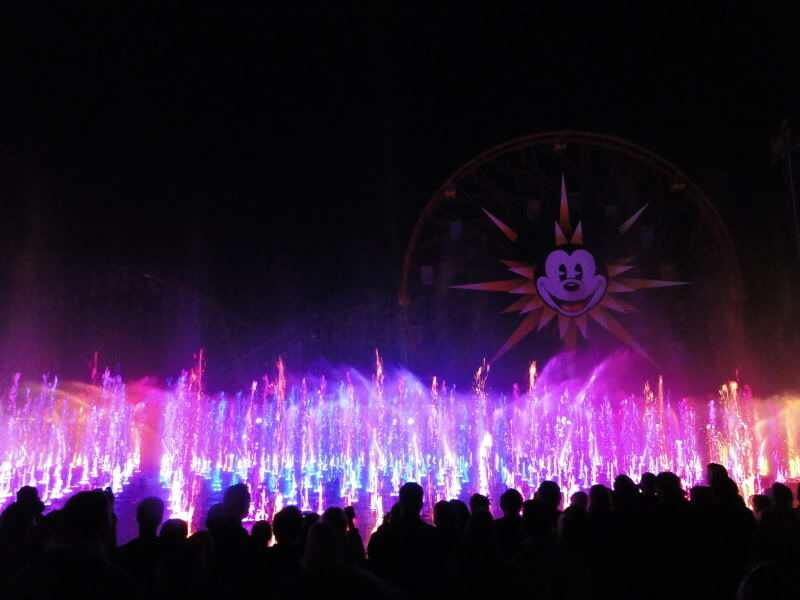 OK, so it has been a week since our dud of a meal at Wine Country Trattoria and first viewing of World of Color. We went back and tried again this Saturday, but this time we ate at Ariel’s Grotto. 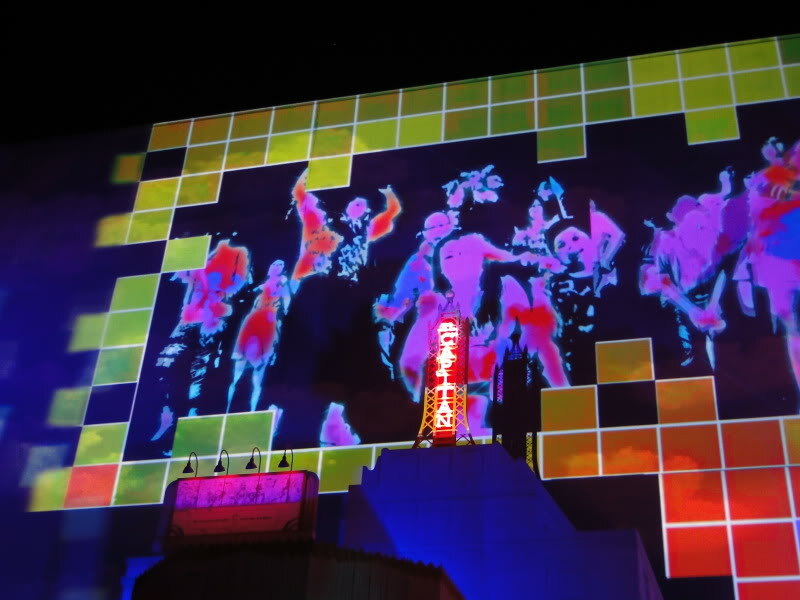 We also noticed some changes to the WOC viewing process and tweaks to the areas, so I’ll give the full report. When we called last week to reserve the WOC package at Ariel’s, the earliest time we could get was 5:20 pm and only if we ate on the patio. (They will tell you the patio is covered, but a good deal of it is in the sun at that hour.) We were also told that a gratuity would be automatically added to the bill. Neither of these things happened. When we checked in at 5:15, we were asked whether we wanted to sit inside or outside (inside!) and given a pager. Five minutes later they took us downstairs. 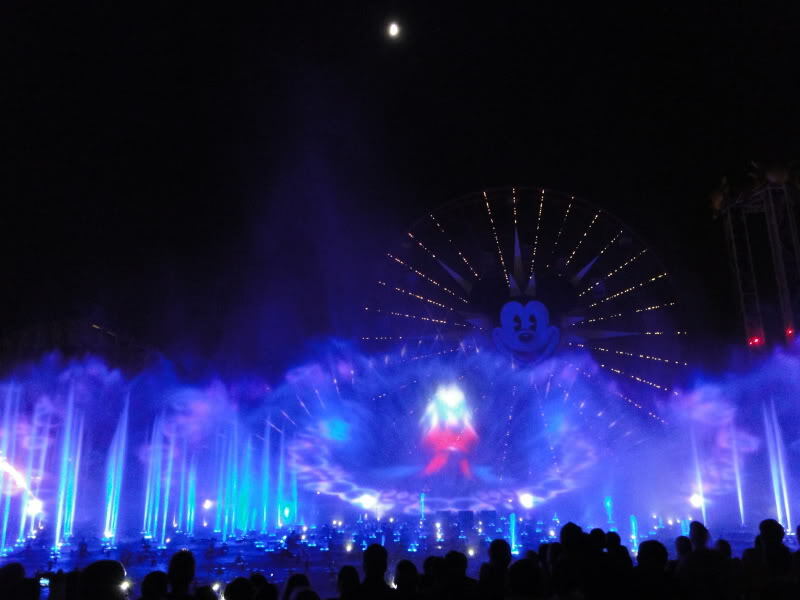 At dinner, Ariel’s only serves World of Color packages, so you don’t have to ask for the special menu. We also didn’t get the idea that we might not have show tickets waiting for us at the end of our meal (something the dining CMs were originally scaring all of us with when packages first went on sale). Our biggest complaint about doing the WOC package at Wine Country Trattoria besides the lackluster food was the reduced menu that cost more. Ariel’s is the exact opposite—if there are only 2 of you, they actually give you too much food! We got the same size tower o’ appetizers and trough o’ desserts they were giving parties of 4 people! Our service was harried and slow, with long gaps. For some reason all of our waitress’ other tables were on the opposite side of the restaurant. If we hadn’t been in a hurry to go not line up for the show, I would have been pretty grumpy about the timing of the dishes. We started with bread and no drinks for about 5 more minutes. Then our entrees were delivered about 90 seconds after the ginormous Tower o’ Appetizers showed up, yet they were already cold. At the end we had to wait 10 minutes to get our credit card and final bill back. However, I would still pick Ariel’s over Wine Country Trattoria any day. The food is Olive Garden quality, but at least there’s more food, a better variety to choose from, and what you get is pretty much what you expect. Plus you pay about 10 bucks less than you would at WCT when all is said and done. There’s something about WCT’s overreaching and under-delivering that just rubs me the wrong way! 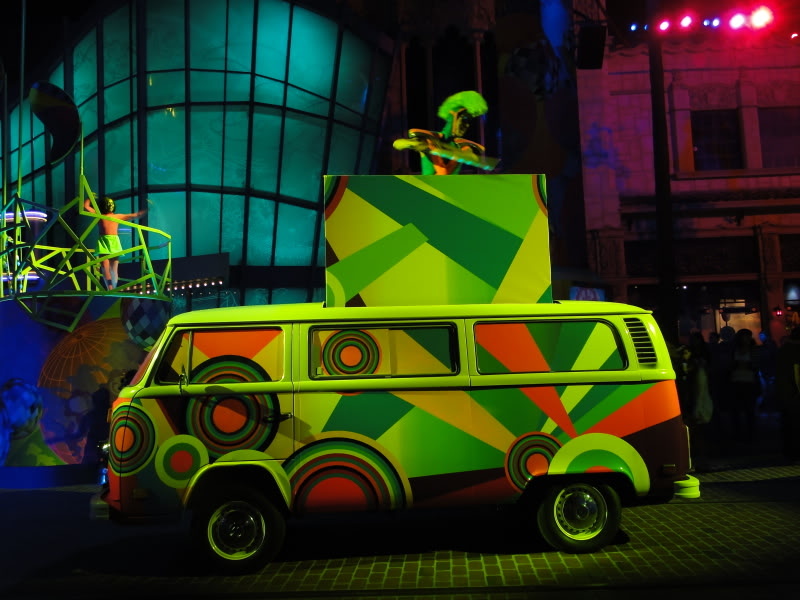 It’s too bad they couldn’t make this work when they shoe-horned the show into the lagoon. Originally they’d talked about doing dining packages on Ariel’s patio, which would have been fabulous. 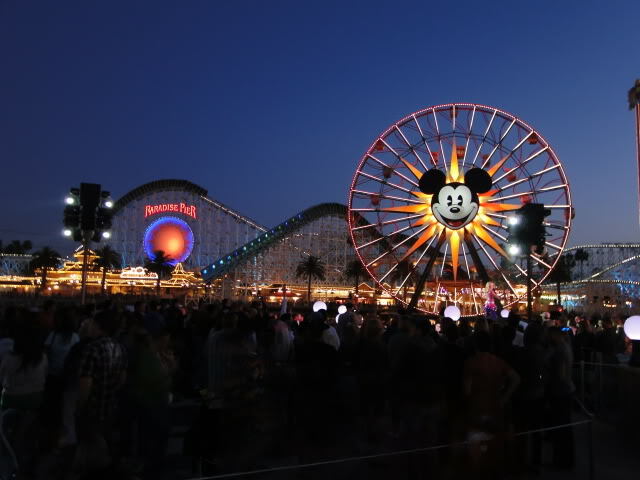 After dinner, Patrick went to ride Mickey’s Fun Wheel to get some arial shots of Paradise Park for me, and I went over to the area where everyone was pretending not to be in line for the show. I sussed out where the entrances were for each of the different colors. 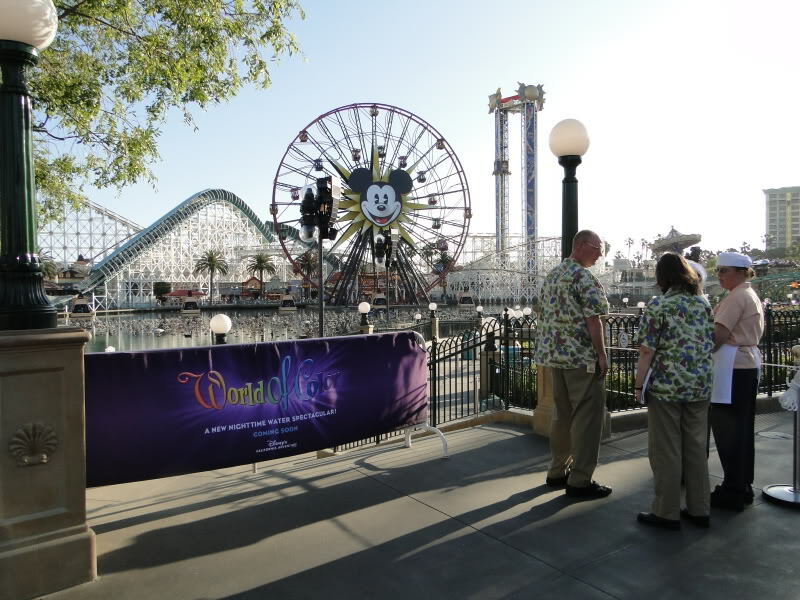 They were slightly different—now they have a dedicated entrance just for Preferred Dining Package holders instead of lumping them in with Blue FASTPASS holders. The CMs kept shouting “Folks, we are not lining up for the show yet! Come back in an hour!” Well, this was at 6:30pm, and at 7:03pm, they let us in. So don’t listen to ’em! Here’s all of us pretending not to line up after the barricades were installed, around 6:60pm. There were a lot more of us than last week. At 7:00pm, they made a small gap in the barricades and the crowd surged forward. I was first to the Preferred Dining Entrance! The area was delineated differently this time—the stairs we’d stood on last time were no longer part of Preferred Dining and now go to Blue FPs. 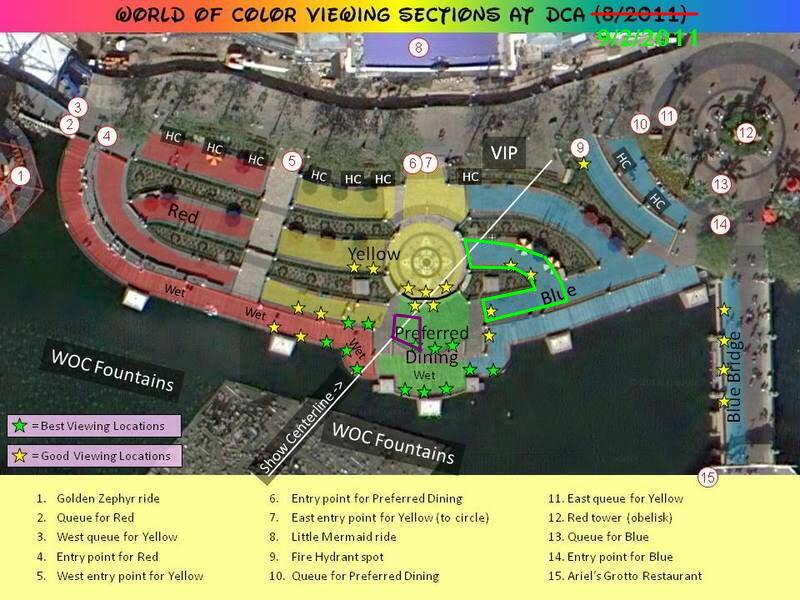 The big circular area and the whole area in front up to the fence is for Preferred Dining. I made a beeline for the fence. Last week this had been referred to as a “wet” zone, so we brought our ponchos. Maybe it was the wind, but we got no wetter than we had last week. 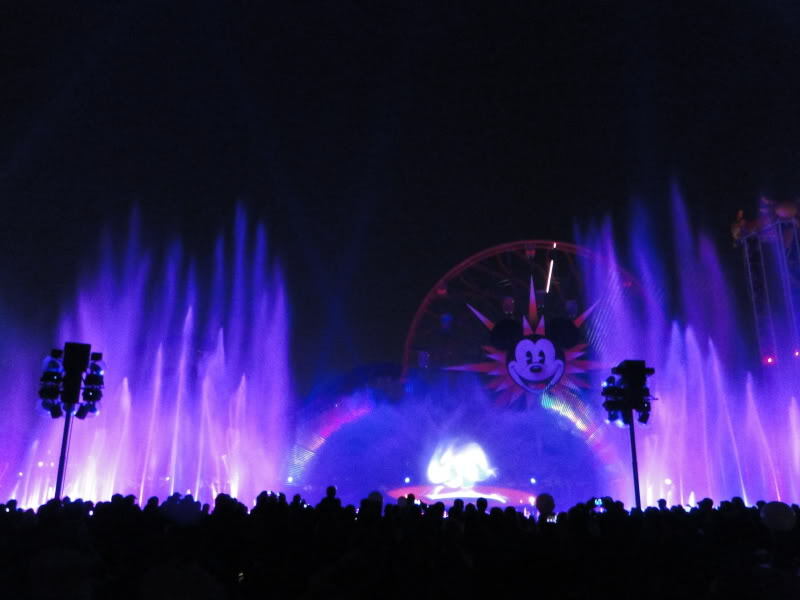 Another difference: The very front center section, in the splash zone, is now YELLOW FP, not Blue. The Blue Section is still a good view, but not dead center. For some reason, they didn’t let people in the Yellow section in until 15 or 20 minutes later, and it never really filled up til right near show time. We liked our view from this area MUCH better than last time. 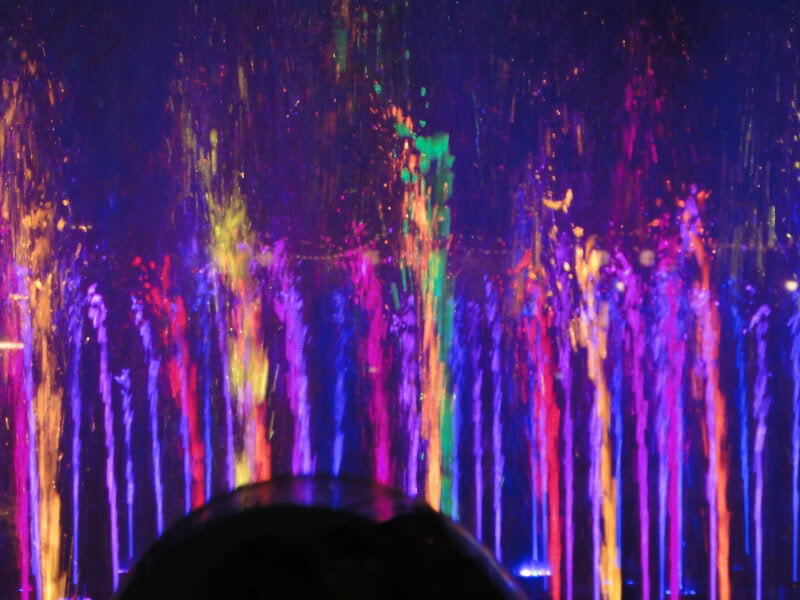 Although you had to turn your head a little bit to take in what was going on in either end, the view in front was centered and you could see all the effects on the water. I can tell why they removed the section we were in last time from the Preferred Viewing area. 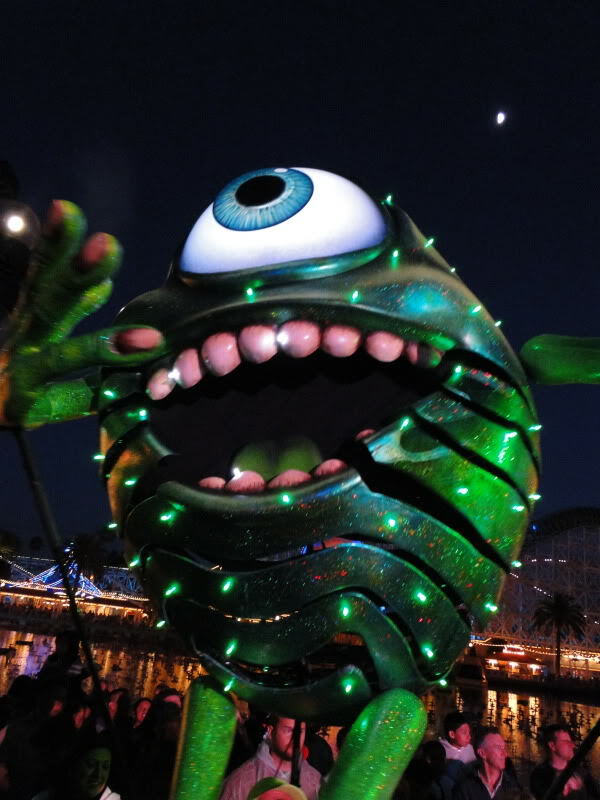 During the pre-show, Mike Wazowski ended up stationed right in front of us, and I nearly got clocked every time he swung his arms! 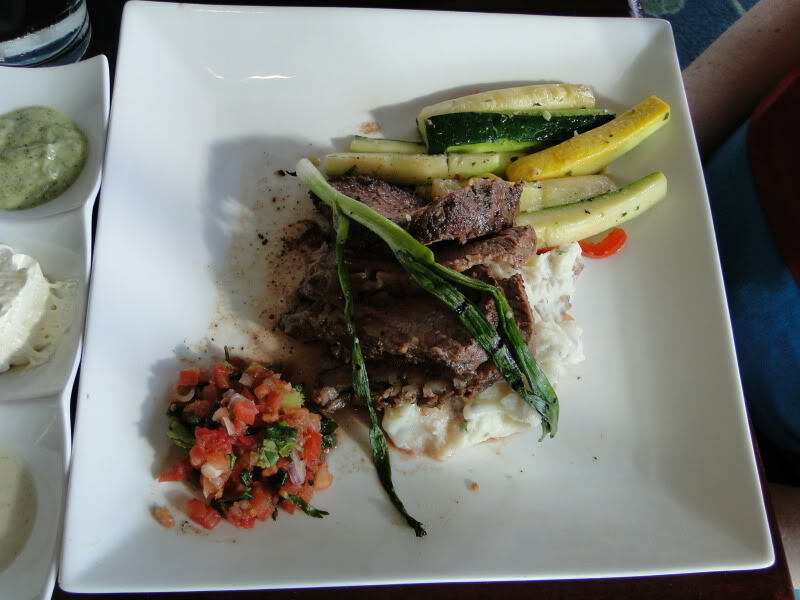 Do you still feel like Carthay Circle provides the best food for those getting the WOC dining package? Even with the prix fixe menu? 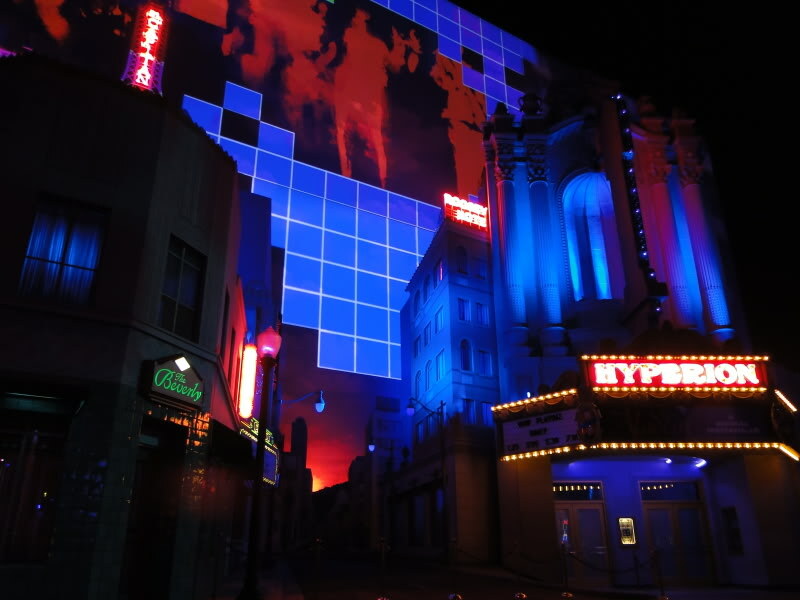 Is there an aesthetic difference in seeing the first WOC show versus the second one? We are planning on getting the package for Dec 4th. From what I understand it is $39 for lunch and $59 for dinner for the prix fixe menu. I have never noticed an aesthetic difference between the first and second shows, so if lunch’ll save you $20 each, I say go for it. The only difference I can think of is maybe lighter crowds for the later show, but you’ll have a reservation anyway. I do think Carthay Circle has the best food at any price. 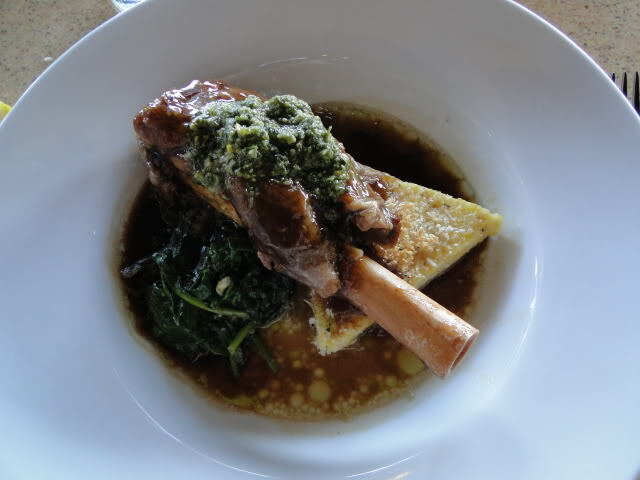 There’s just no comparison to what they serve at Ariel’s or Wine Country Trattoria. You mentioned in your last comment that you were going back in a few weeks, so I was just wondering if you could update on what’s changed when you get back. I’m taking my boyfriend for his birthday in a few months. 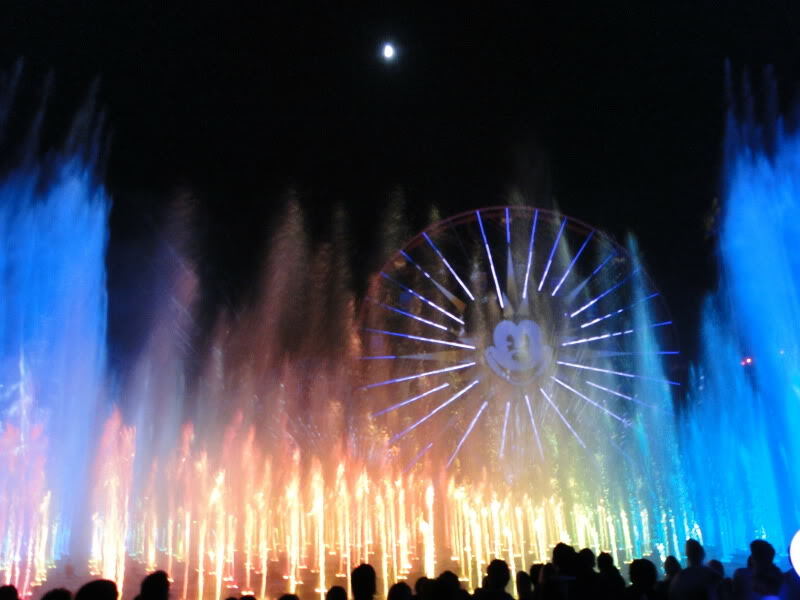 I’ve only ever done the regular FASTPASS admission to World of Color (and gotten Blue every time). It’s generally good, but I’d like to see if we can get a different view. If you could let me know when you get back whether the preferred diner’s section has stayed the same or what the section delineation looks like (I haven’t been since March), I would appreciate it. Thanks! Hi Katie! 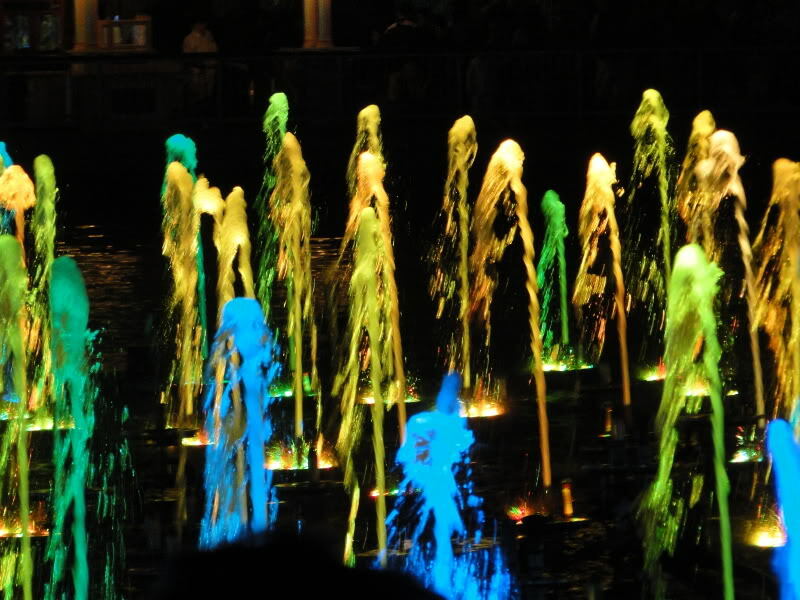 I am a bad blogger… I ended up passing on both my chances to see World of Color while we were there, so I don’t think I have any more recent info than you. 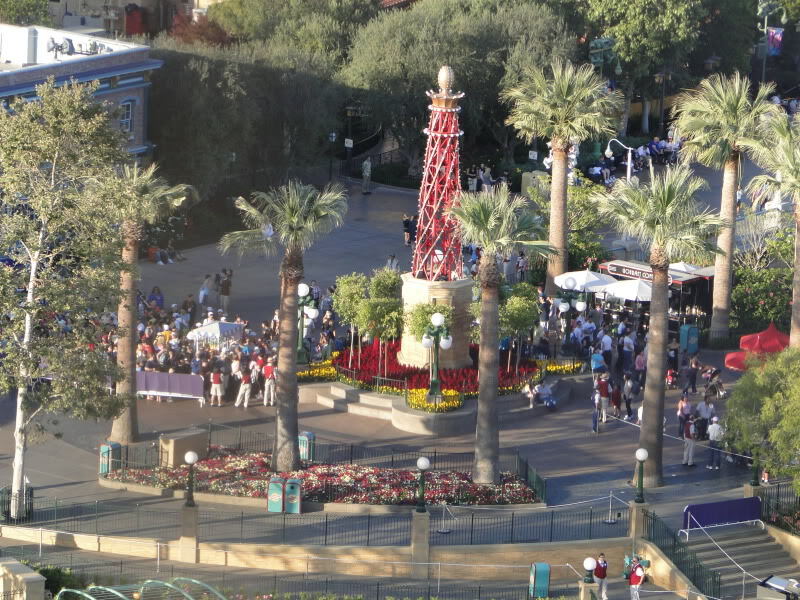 We were told that the dining package viewing area is still the center (green) portion of the viewing area when I called to make our Carthay Circle reservations. Also, you now have to order off a special prix fixe menu at Carthay Circle to get the tickets, not just any two entrees and appetizers or desserts. Sorry I don’t have any better info! 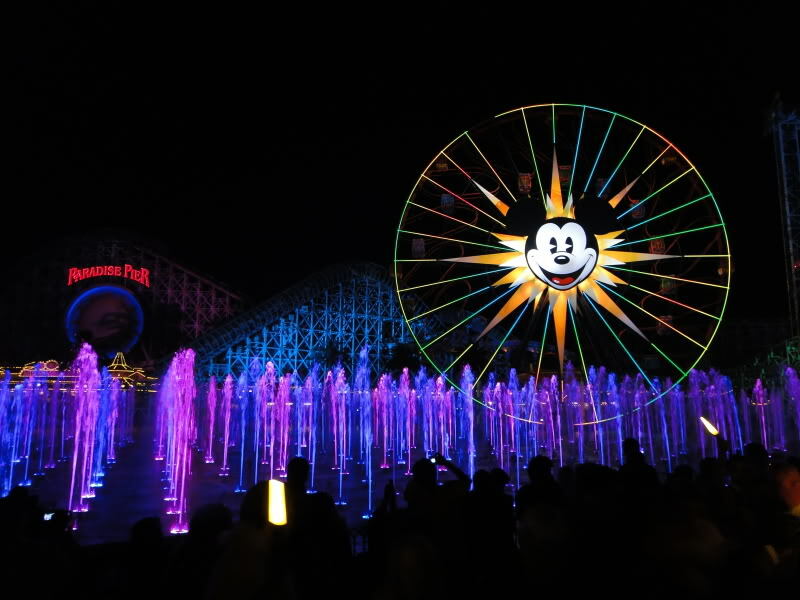 Hello, so in my research I have found different stories regarding the lunch vs dinner world of color packages. I’ve read that the lunch packages don’t send you to the preferred section but to a blue fast pass section. I have done the tatorria dinner package and the preferred spot was beyond worth the price of ok food. But if the lunch still gets you into preferred then why not get the cheaper meal? Do you know anything about this? OK, so I just contacted Disney Dining, and according to the supervisor, there is only one spot for dinner package buyers no matter what time of day they eat. Patrons are not funneled into the regular Blue FASTPASS section, I was told. Granted, you’ll get a different answer from every different Disney CM you talk to on just about anything, but they seemed authoritative. The difference between lunch and dinner is the time of the show you get—supposedly lunchers get the first show and dinner…ers get the second show. I can check this all out when we go again in a few weeks. Well, Carthay Circle Restaurant definitely has the best food. Viewing-wise, you’ll be OK in the dinner package area if you get there early and secure a spot at the top of one of the shallow staircases. 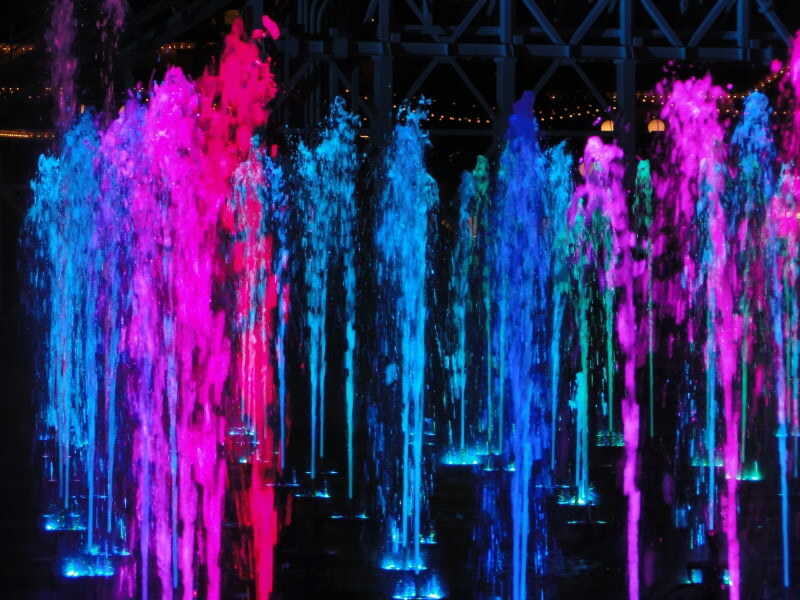 Otherwise, if you can get down to the railing in the splash zone, it’s wonderfully immersive (literally – LOL!). 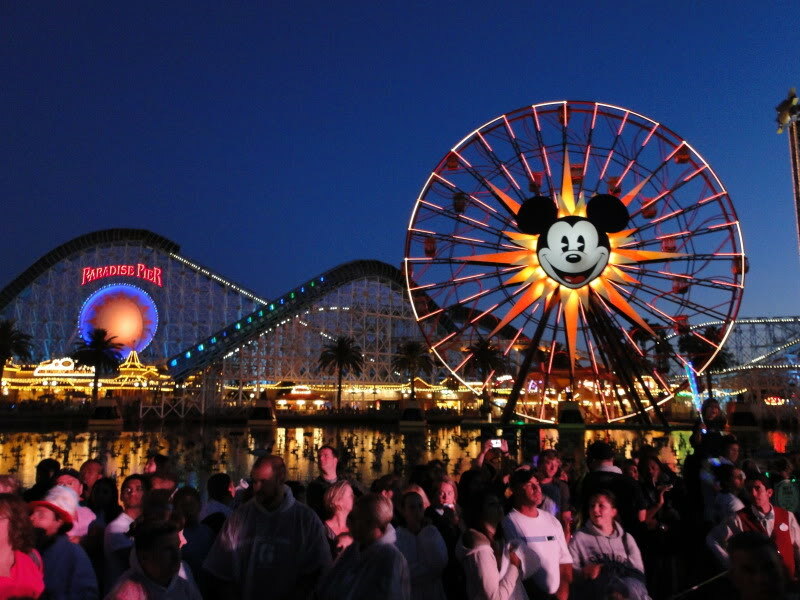 We will be visiting Disneyland this fall with a 4 adults, a 4 year old and a 1 year old. We don’t plan on taking the 1 year old to the show so obviously at least 1 adult will also not go. What do you recommend for the best viewing area for our 4 year old? Also, based on the fact that one ticket probably will not be used, I assume you would suggest a lunch option at Carthay Circle? 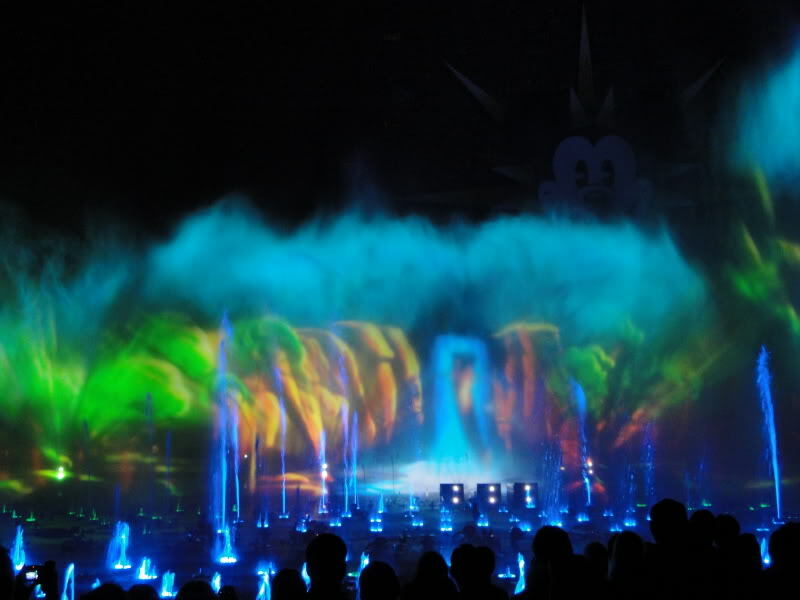 Do you have a suggestion for Fantasmic? 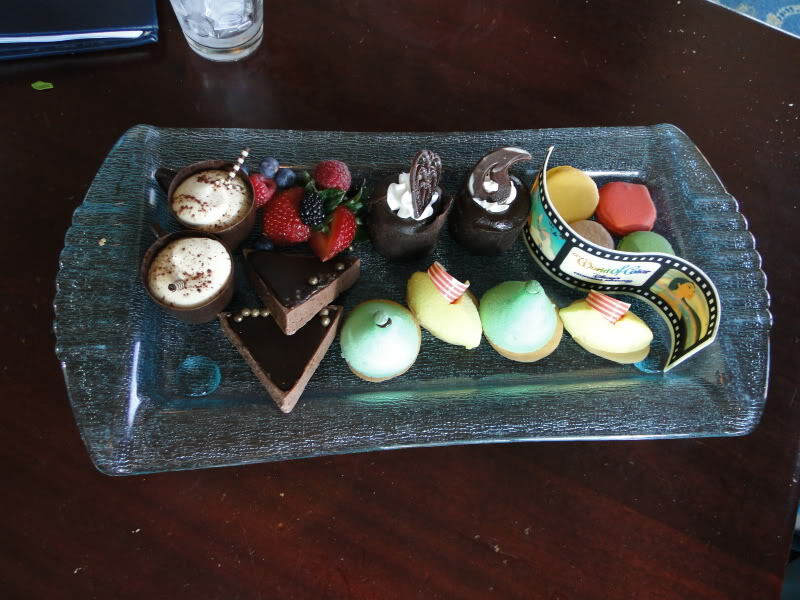 I noticed they also offer a premium viewing option with the purchase of a dessert sampler. Hi Charlotte! Do you think the 4-year-old would prefer to be up front in a poncho getting drizzled on or farther back? If you want to stay dry and can be at the front of one of the the dining package sections tiers, s/he will probably be able to see OK. But if you’re behind a lot of people, it may be difficult. We like being in the very front “splash zone” which isn’t technically part of the dining package area, but they seem to let you fill in there if you have a package and you don’t mind getting a bit wet. 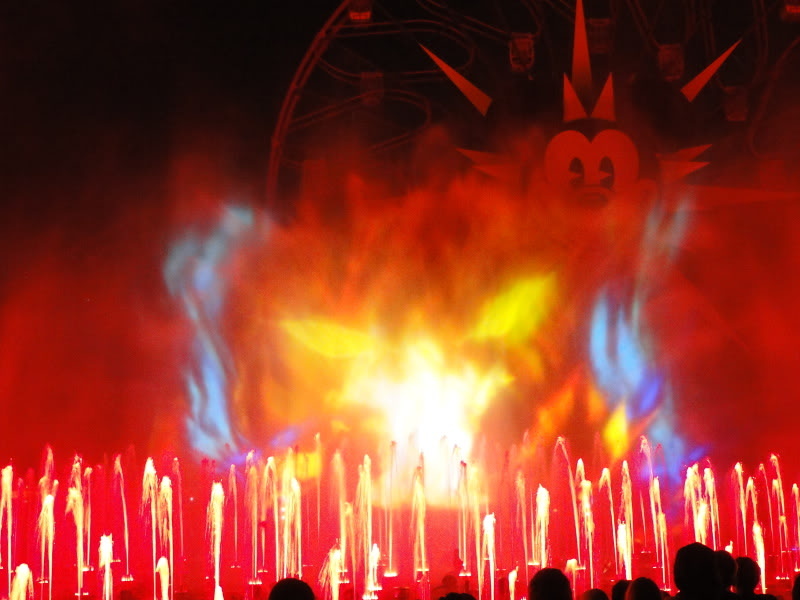 I would skip Disneyland’s Fantasmic! dessert party. We felt like the money and time you need to invest to get one of the very few good seats in that reserved section weren’t worth it, and the desserts were all ice cold and flavorless. He loves the water so I don’t think getting wet would be a problem and we definitely want him to be able to see without one of us holding him. From the map you provided above (thank you), it looks like the red Fastpass wet zone would be the optimal spot. From what I have read, the viewing area on the Fastpass is randomly assigned. 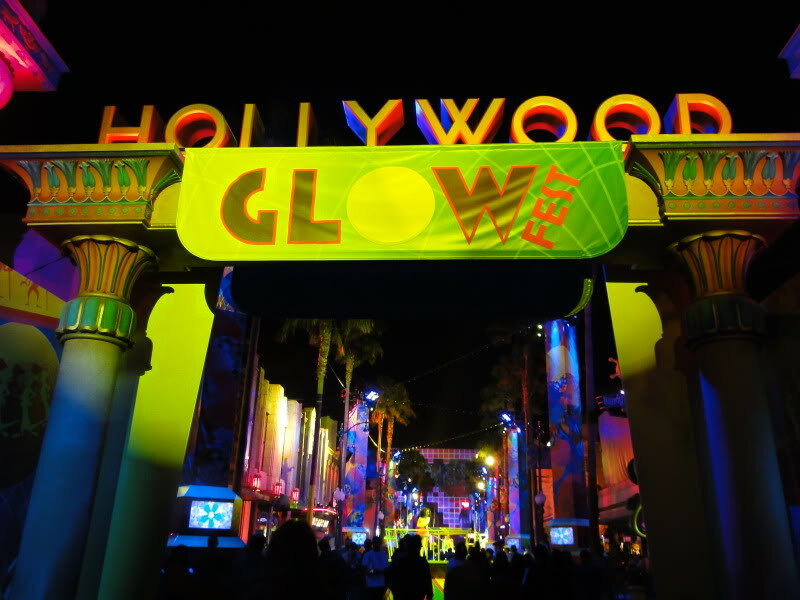 Do you have a tip on how to ensure we receive Fastpasses for the red viewing area? Back in the day, when Red was a slightly different area and not so good, the passes seemed to come out of the machine in order of best sections: Blue tickets would all be distributed first, then Yellow, then Red. But I haven’t gotten one in so long, I don’t know if that’s still how they’re doing it. The Red section isn’t the only one with water frontage, though—blue and yellow have some too! Hi, your original post here is almost 3 years old. 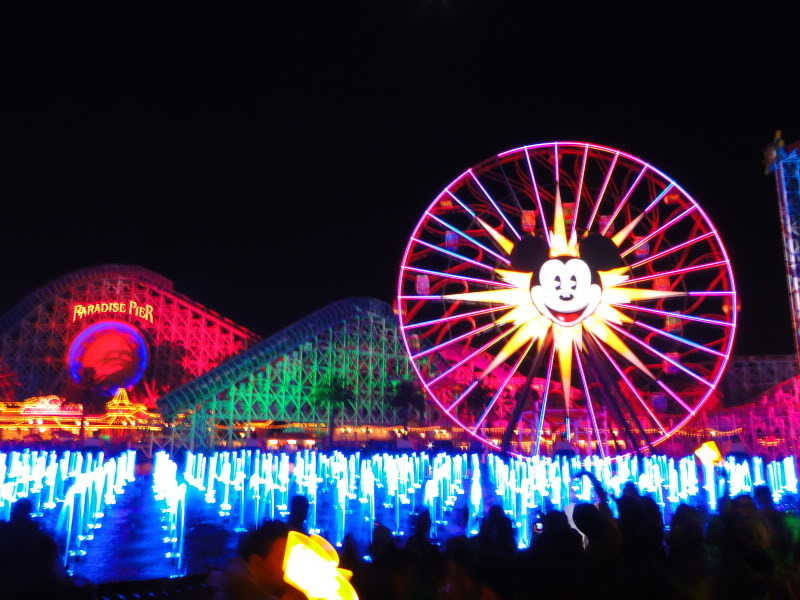 Trying to decide between which WOC dining package to choose for this June. Don’t seem to get a clear recommendation SURPRISINGLY from anybody out there between Wine Country Trattoria and Ariel’s Grotto as it pertains to the Pre Fixe WOC dining package. How recently have you gone to either of them (because I know they continue to change and evolve)? And can you provide a recommendation or another place where I can get one? Hope to hear back this morning if possible. Thanks much! 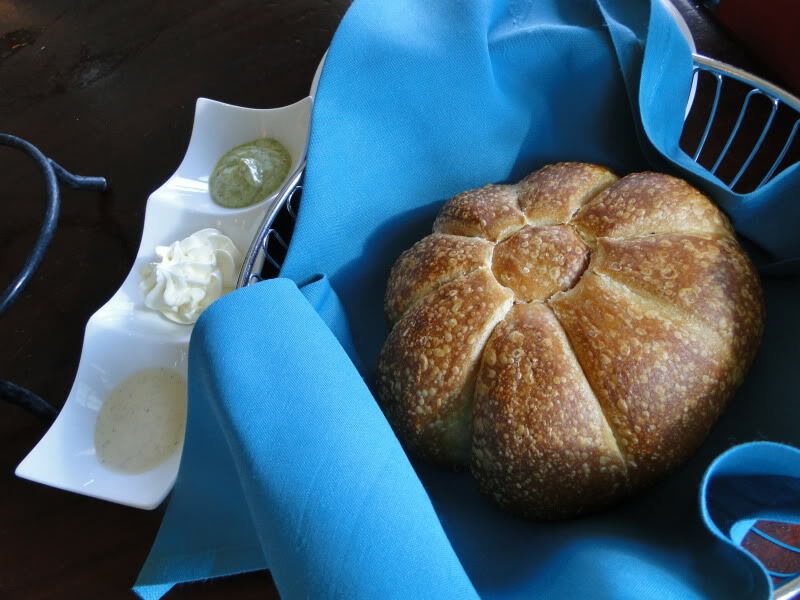 Although I have updated this post periodically to reflect changes in the participating restaurants and policies, I haven’t been back to either restaurant because I just don’t think they’re very good. These days we do the WOC “package” (each person has to order an entree plus an appetizer/dessert) at Carthay Circle Restaurant because the food there is superior in every way. Thank you so much for the quick reply!!! I have found it difficult to find specific recommendations on this topic, so I appreciate what you have very much. 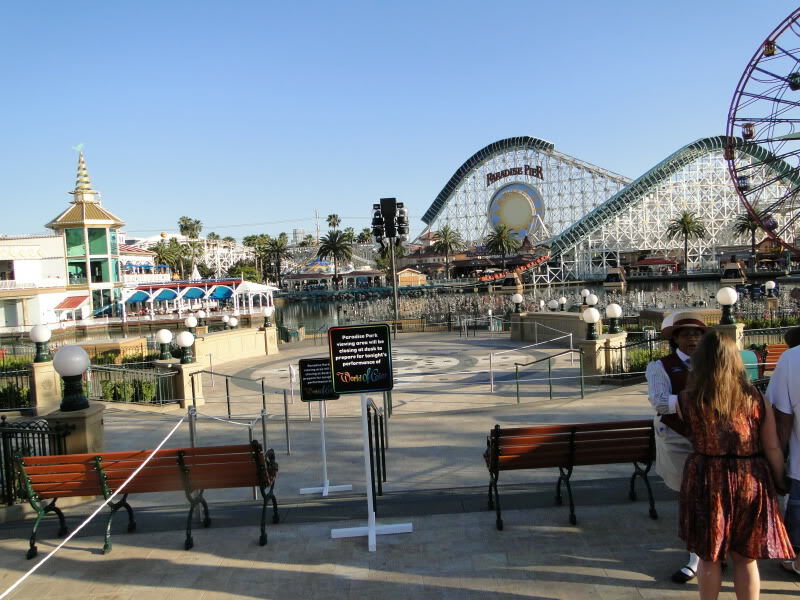 Is the viewing area for Carthay Circle as good as it is for Wine Country Trattoria? I have read that Wine Country has the best reserved viewing area and that is what I am most concerned about (though I would still like to get the best meal we can out of the deal, too). 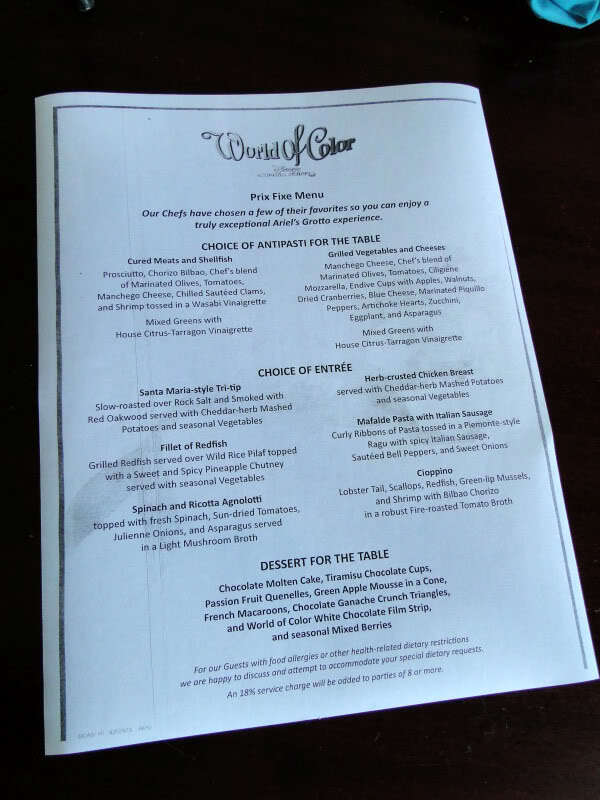 I hadn’t heard that they were segregating Carthay diners from Wine Country diners, and that certainly wasn’t our experience a few months ago. 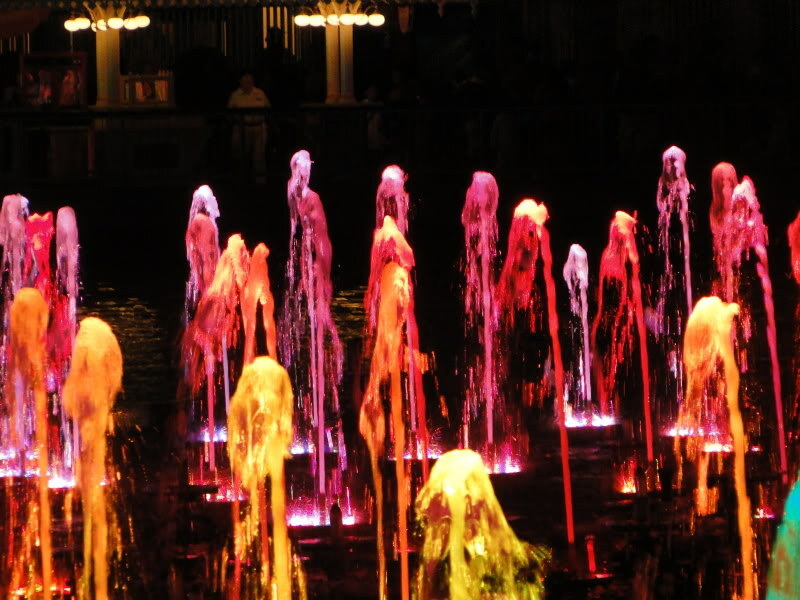 When they opened the viewing area, we just walked to the center, by the fountain. No one told us we had to be in a certain area based on where we’d dined. 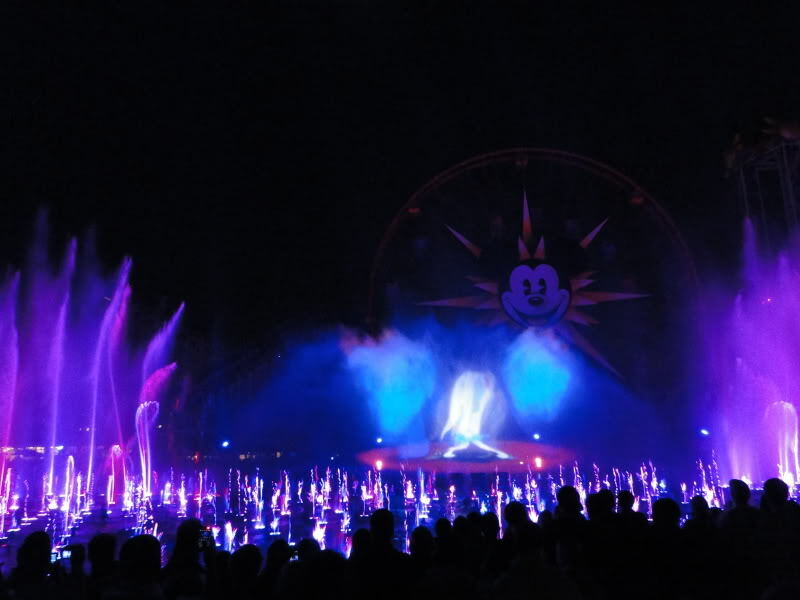 In fact, we ended up going down to the front middle (in the splash zone, our favorite) when they started letting us, which isn’t even part of the dining area. 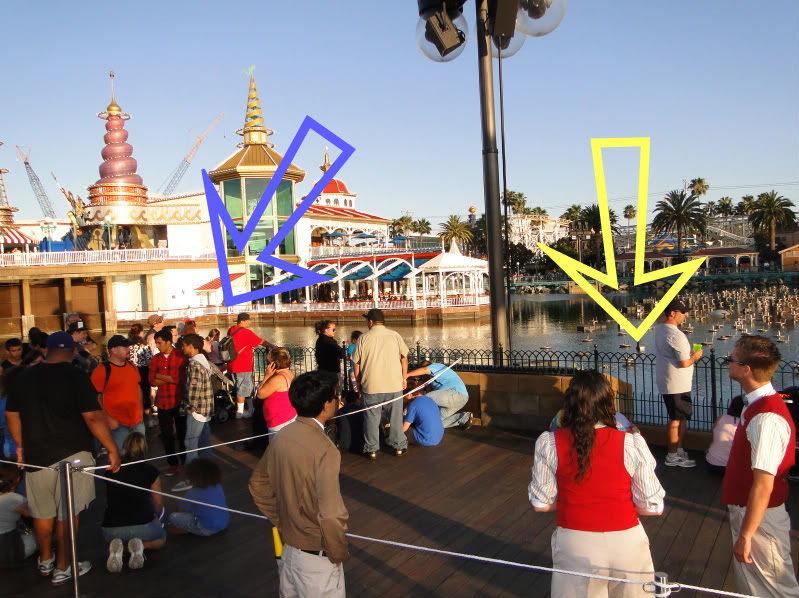 From my quick research just now, it seems enforcement of this segregation depends on which cast member you talk to (classic Disney!). I think if it’s very important to you that you get a certain section, get there early so you aren’t dealing with harrassed, over-worked CMs. 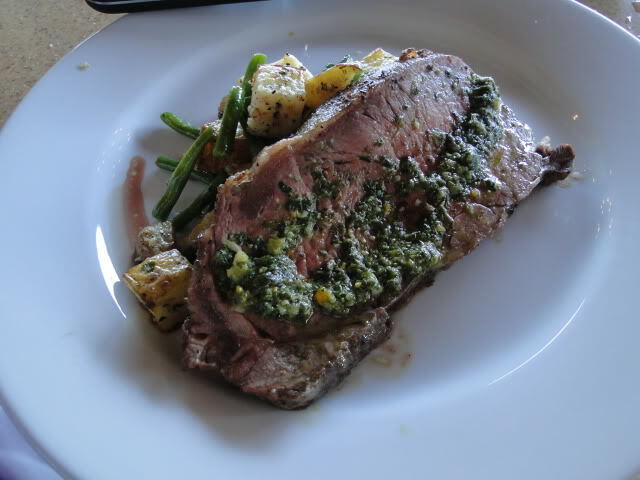 Or just eat at Wine Country—mediocre food is kinda par for the course at Disney anyway! Thanks for all the information. 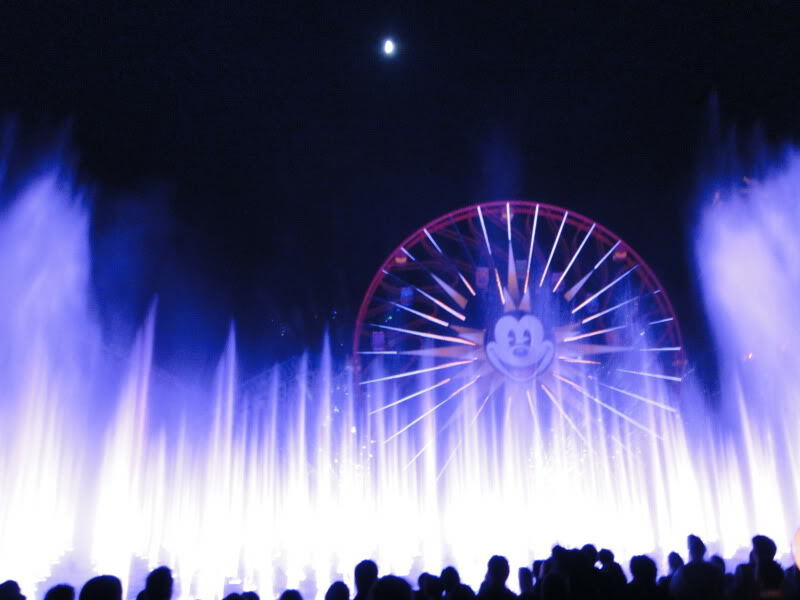 WOC is ne of the top 3 things I am most looking forward to when taking my daughter who just turned 6 for a surprise girls only weekend! 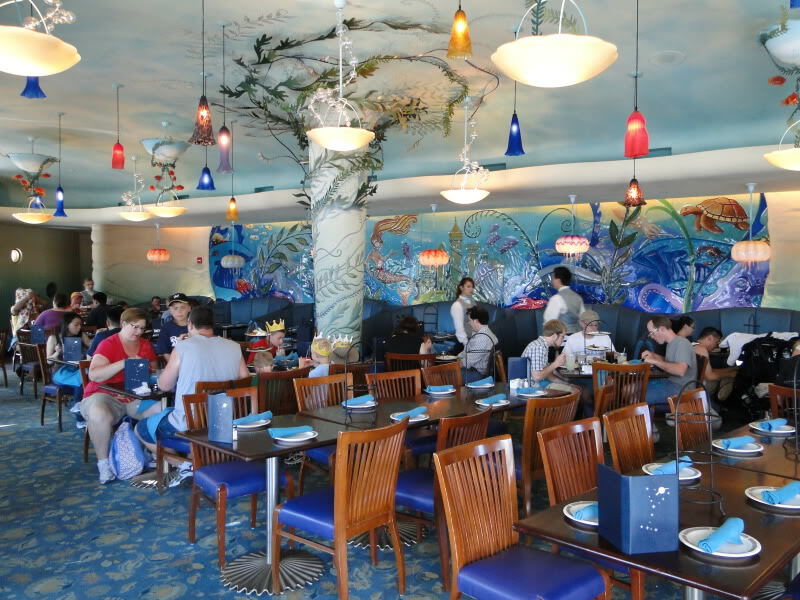 Do you think that the preferred dining seating is the best for a child to get a good view? Or will any view be difficult due to everyone standing? 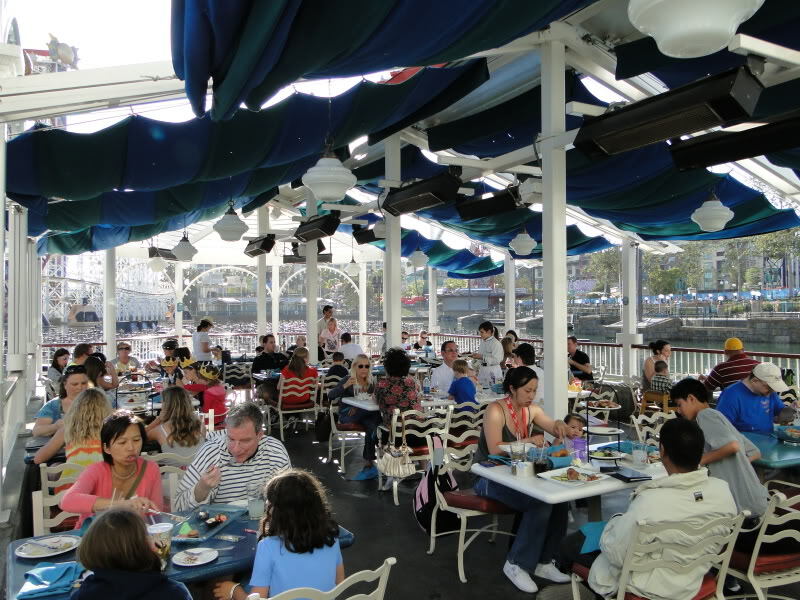 Also, do you know if we do Ariel’s Grotto for character breakfast will it include preferred dining seating to WOC? Thanks again! Much appreciated. I haven’t been to Disneyland in 22 yrs! And I have been waiting to surprise my daughter with a trip since the day I found out I was pregnant!!! So excited! What a blast you all are going to have! Since there is no seating, I would say that preferred view is no guarantee of a good view. At best, you might have a better chance of securing one of the few “fronts” of the tiers closer to showtime than with the public viewing area, just because fewer people pay for the package. 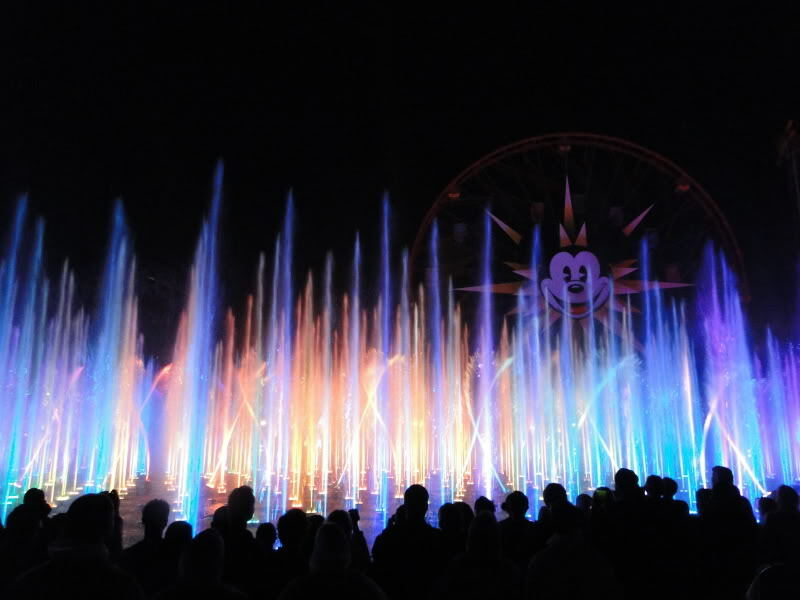 Ariel’s Grotto only offers preferred seating for World of Color at dinnertime. 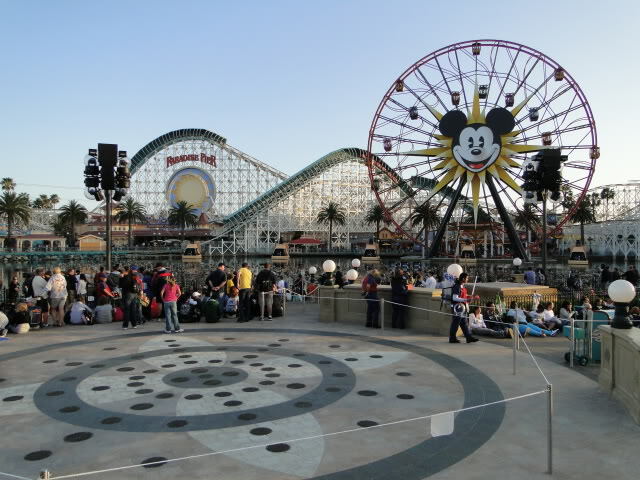 What you might want to do instead is buy the box lunches that come with a FASTPASS for one of the general viewing areas, or just get a FASTPASS when you get to the park. Otherwise, you’ll have to have dinner at Ariel’s, Wine Country Trattoria or Carthay Circle Restaurant to get preferred seating. 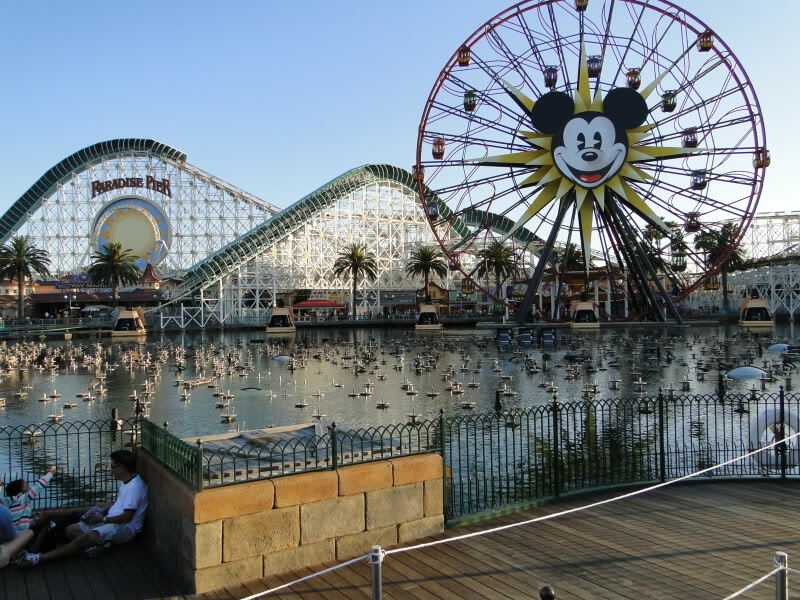 I just wanted to let you know that after hunting unsuccessfully around the entire internet (including disneyland.com) your blog post was the most informative and comprehensive description of what to expect. I wanted to make sure that if I was paying $40 for dinner that the view would be worth it. Thanks again for the excellent advice. We booked tickets for all of us based solely upon your advice. The website is http://www.disneymeetings.com/disneyland/ and the phone number is 1-714-520-7025. Happy planning! Hey there! Your advise in this thread was instrumental in planning our DCA day of our honeymoon this past December, but when we went back this month we found a couple changes with the Ariel’s Grotto Dining. Instead of your choice of appetizer towers, they now have a standard platter that your server brings with the menus when you sit down. It’s pretty much a blend of the two tower choices they had before, one tier is meats and cheeses (the spicy sausage is gone 🙁 ) the middle tier is a pile of seafood salad and some cold cooked veggies. Salad is the same. We felt that having the one tower definitely helped speed of service, but I miss the monster prawns and sausage. Just wanted to update anyone looking here for info. 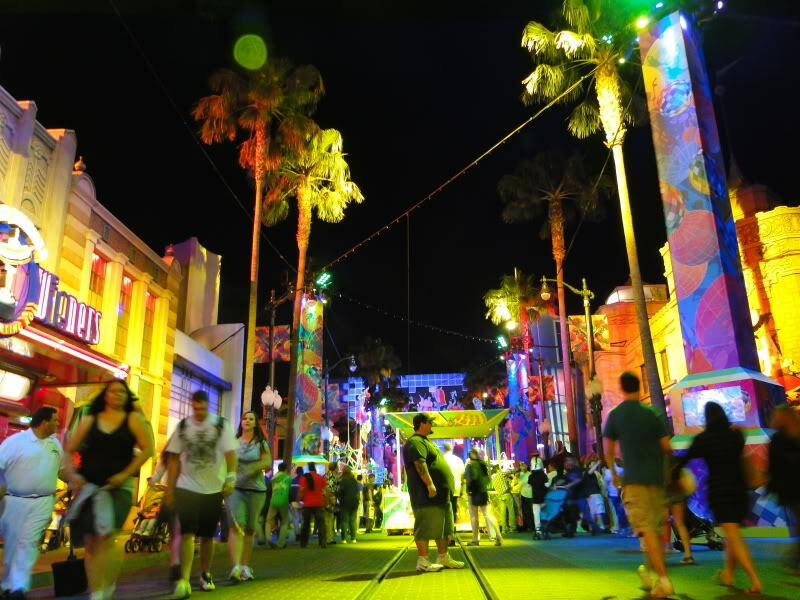 Also, do you have any guides for DL Vets going to WDW for the first time? We’re planning on going for our 5th Anniversary but I haven’t been since I was 6 months old so I don’t even know where to begin planning! Thanks for the update! 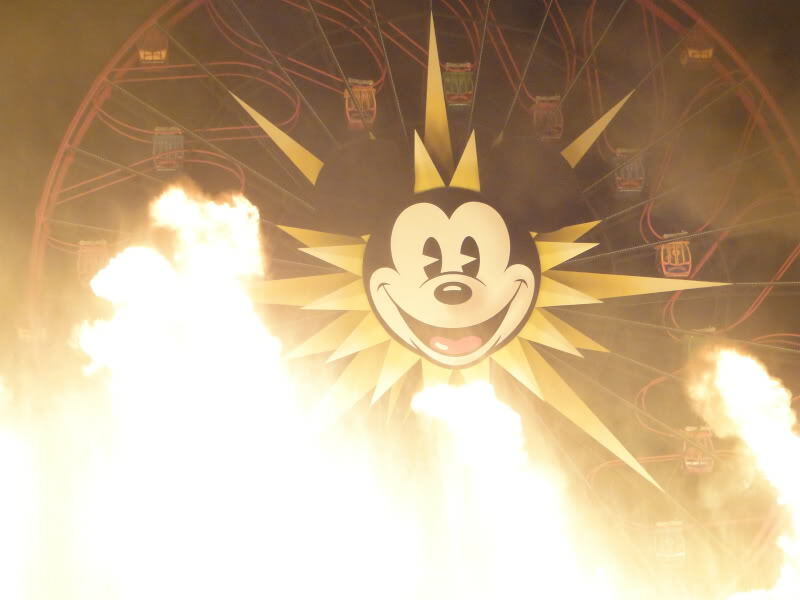 As to the guide… I am probably contractually obligated to tell you about PassPorter’s Walt Disney World guidebook, but I’m not only a shill, I’m also a fan! 😉 I bought PassPorters for years before I started working for them (and before we even set foot in WDW), and they had me so well prepared for WDW that I was able to confidently lead Patrick around like a pro. (With one minor misstep that we talk about in tomorrow’s episode of the Disney Wedding Podcast—which you actually might find helpful because it’s all about the most romantic resorts at Walt Disney World!). Any idea if the “Picnics with Reserved Viewing” have a good view of the show? Or is it the same as getting a fast pass early in the morning? It is the same viewing area as the FastPasses, except you won’t ever get the Red area (which some find undesirable)—only Yellow or Blue.